It's official: after three decades of debate and several brushes with death, the Purple Line broke ground this morning in New Carrollton. 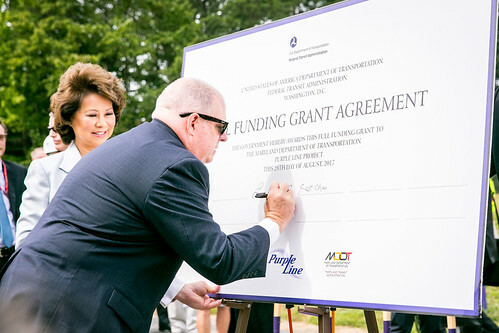 Governor Hogan signs the Purple Line's federal funding agreement as US Secretary of Transportation Elaine Chao looks on. All photos by Aimee Custis. "We've made it!" exclaimed Pete Rahn, Maryland's secretary of transportation, throwing his arms in the air. "It's been a long road, but we finally made it today." 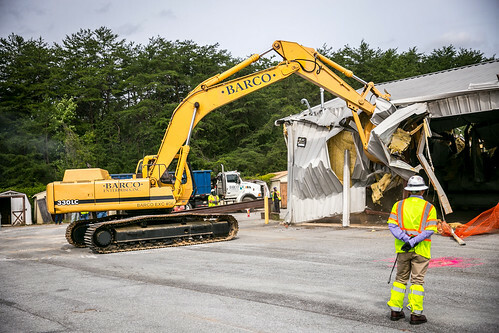 In front of hundreds of local officials and well-wishers, Governor Larry Hogan and US Secretary of Transportation Elaine Chao signed a federal grant agreement for $900 million, before the governor boarded a bulldozer and tore into a building that will make way for a future rail yard. Governor Hogan, riding a bulldozer, tears down a building to make way for the Purple Line. "The Purple Line will be a transformative asset for our state," Hogan said. "We will continue to find the most cost-effective ways to invest in and improve our transportation systems." 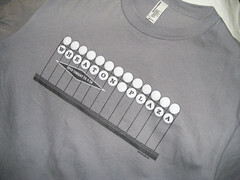 The 16-mile long light rail line will run between Bethesda and New Carrollton and have 21 stations, including transfers at four Metro stations. The $2 billion project will include a mix of federal, state, and county funding. There have been no shortage of setbacks for the project since it was first proposed in 1986, but the project was largely a go by 2014, when Governor Hogan took office. Another year was lost after a judge voided the project's approval last summer in a lawsuit from a group of residents in Chevy Chase. The project was close to losing its federal funding when an appeals court restored the approval last month. 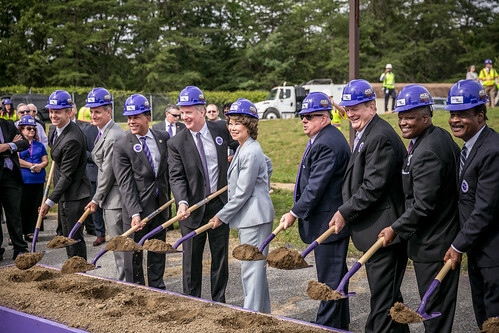 Local officials use purple shovels in a ceremonial groundbreaking. It's also notable as the nation's largest transit project built through a public-private partnership. Purple Line Transit Partners, a consortium of private companies, will build and operate the project in exchange for payments from the state for the next 35 years. It's something the Republican administration wants to encourage, and Secretary Chao said it could be a model for other projects around the nation. "P3s are used throughout the world to fund transit projects, and can be used to invest in infrastructure around the country," she said. "We do not have the money to fund every project in this country," praising Montgomery and Prince George's counties for "having some skin in the game" and each contributing several hundred million dollars towards the Purple Line. The Purple Line is projected to have 56,000 daily riders by 2030 and create 52,000 jobs, both directly through its construction and indirectly from investment along the corridor. Those who spoke at the groundbreaking this morning, including Senator Chris Van Hollen, Congressman Anthony Brown, and Montgomery County Executive Ike Leggett, cited the project's benefits to the state of Maryland as whole. "This will not only help people off the roads and protect the environment, but create jobs all over the state. 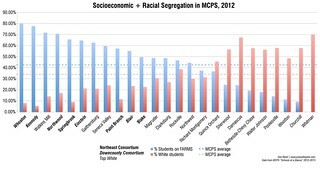 This is a project for all Marylanders," said Rushern Baker, Prince George's County Executive. 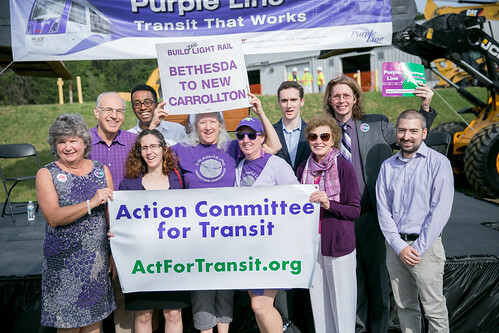 Purple Line supporters celebrate today's victory. Multiple officials gave a shout out to Harry Sanders, who advocated for the project with his wife Barbara and son Greg for decades, before he passed away in 2010. "That persistence over a period of decades is what has helped us bring here today," says Senator Chris Van Hollen. Construction will literally start today. On the way home from the event, we passed a group of people in construction gear on University Boulevard in Langley Park, carrying what appeared to be blueprints for the Purple Line. If everything goes as scheduled, the Purple Line will open in 2022.